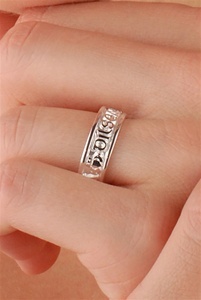 Sterling Silver Ladies Celtic Wedding Ring. Measurement: 6.2 to 6.3 mm wide. Available sizes 4 to 11 with half size increments. I couldn't decide between this ring and another so I ordered BOTH! This is just stunning. I will be keeping it set back for special occasions as it is just too pretty to wear every day. The quality of the workmanship is excellent. I am proud to have this piece in my collection. The ring with is detailed work is beautiful and very meaningful to me. The band width is larger than I expected but its always difficult to judge true fit from a picture. Ordering was easy. No problem with shipping. Would definitely order from Claddaghring.com again.